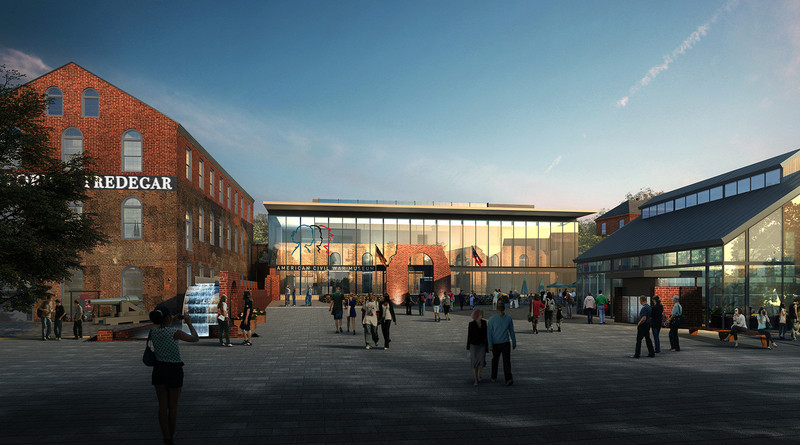 Construction of the new American Civil War Museum will begin this July. It is sited to provide connectivity between the museum’s existing buildings while serving as a welcoming centerpiece for visitors to the museum’s campus. The spine of the museum’s campus is comprised of the new lobby and collections and galleries directly behind (represented in black). Most striking is the glass encasement of a ruin wall from the Tredegar Iron Works, which will be the lobby’s most prominent feature, visible from Tredegar Street. The new wing of the museum will house two galleries – one permanent and one rotating – an experience theater, and storage of the museum’s collection, which was previously located offsite. The new plaza creates a new entry experience and raises the ground level of the museum above the James River floodplain. The lobby’s interior is defined by the existing ruin wall. It serves as a grand reception space, enabling visitors to get a close look at the historic ruin, and acts as a gentle delineation between public space and paid exhibits. Want to see more? Explore the plaza and interior below. American Civil War Museum from 3north on Vimeo.